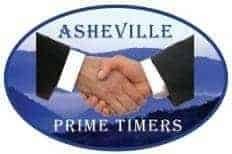 Asheville Prime Timers is a unique organization of Gay and Bi men in the 40 and upwards range (anyone younger is accepted, as occasionally we have members with younger partners). Locally we grew out of the, once a month gathering, Asheville Supper Club which is the oldest continuous meeting organization in Asheville dating back to 1980. Many members were looking for a more structured group with activities over the year and not just once a month meeting. We found Prime Timers World Wide and became a chapter 4 years ago. The main purpose of our Prime Timers is to welcome new comers as well as other residents of the area who are looking to meet new friends, experience events with others and for singles or widowers to reconnect with what is happening in the community. We are not a hook up group. We do afford the opportunity for couples and singles to make new friends to enjoy dinners and other activities. Asheville Prime Timers meets once a month. Sometimes at restaurants or our home, St. Mary’s Parrish Hall. We maintain this website for referral of activities both exclusively Prime Timers and community of interest to members. We also have excursions and tours locally and overnight day trips. Becoming a Prime Timer affords you as much or as little interaction as you desire. No one is ever pressured to do an activity. We are always here to remind you of upcoming events and send out reminders to our members. There is no mailing list for non-members.